This is our annual fundraiser for Breast Cancer research. Please help us raise money for breast cancer research! This will be our 21st year. Let's make it our BEST EVER!! Silent Auction Items are closed as of 9/15/18 and are on display for bidding! Thank you everyone! Blocks for the block auction will be accepted through Saturday, 9/22/18. Thank you everyone for your fabulous donations! Its going to be a fun day! 10:30 Welcoming Remarks, Fabric Swap Distribution and Mystery Quilt Project revealed. There's so much you can do to help! Donate some blocks for our Block Auction, donate a finished item for our Silent Auction, donate $, bid in our Silent Auction, register and join us that day for lots of fun (the fabric swap and mystery quilt, morning entertainment, afternoon block auction)! Many bring a snack to share and we have a refreshment table but there are many places to walk to for lunch if you'd like. Have other ideas on how you'd like to help? Talk to one of us! It's a great event and everyone's help is appreciated! The Breast Cancer Research Foundation along with 10% of the day's sales. We have received donations from the following companies! Plus amazing things from our customers and friends! Thank you so much for helping us raise money for Breast Cancer research last year and in years past! 2016 was another great year! 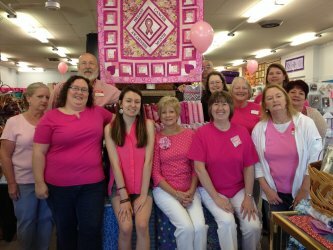 Thank you from the staff and friends at Quilts & Treasures!